Think today's record company politics are bad? 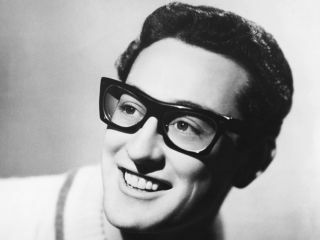 For the late rock 'n' roll pioneer Buddy Holly, they weren't so great in 1957 either. In fact, one of his biggest hits, That'll Be The Day, almost never saw the light of day because of music business machinations. In the summer of 1956, Holly, then signed to Decca Records, recorded several songs in Nashville with producer Owen Bradley. Bradley despised rock 'n' roll, however, and his suggestions for That'll Be The Day - slowing the tempo and raising the pitch of Holly's vocal - were ludicrous. Based on the quality of the sessions, the decision was made to drop Holly from the label. But Holly knew he had a hit on his hands - and, of course, had more to come - so in February of 1957, he spoke with Paul Cohen, head of Decca, about the state of his contract. It wasn't so much that Holly wanted to stay on the label; rather, he was keen to regain the rights to the material that he had recorded the previous summer. Holly taped his conversation with Cohen, during which the label president told the artist that he had no knowledge of his contract being terminated but stated that Decca could, in essence, do whatever it wanted with Holly's material. In other words, Buddy was screwed. Enter Norman Petty, who became Holly's manager and recorded him, along with his backup band The Crickets, in New Mexico. Petty then orchestrated a deal with Brunswick Records for The Crickets (allowing Holly to release That'll Be The Day) and a solo deal with Coral Records for Holly as a solo artist. Ironically, both labels were subsidiaries of Decca - so the label that dropped him wound up having him again twice! Here's Decca's original recording of That'll Be the Day. And here's the hit version of the song, as heard on the Vogue Coral single (a UK pressing) which lists the artist as 'The Crickets with Orchestral Accompaniment.' Apparently Vogue Coral hadn't gotten the paperwork that Holly was a solo act for the label. The latter recording, released in the States on the album The "Chirping" Crickets (via Brunswick), was a milestone in rock 'n' roll. Rolling Stone ranked it at No. 39 on its list of The 500 Greatest Songs Of All Time.